The previous record for fastest speed on a skateboard was set by Swedish downhill rider Erik Lundberg last year which saw the 29-year-old hit 81.17mph. 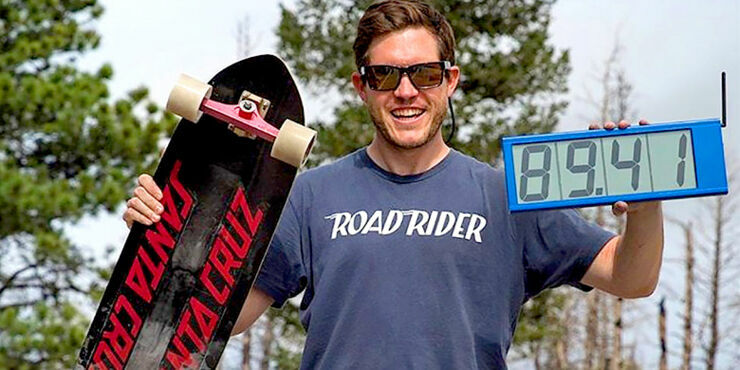 That's what American Kyle Wester needed to break to claim the Guinness Fastest Skateboard Speed Downhill record. So on 29th August 2016 he underwent his attempt and as the video reveals he completely smashes it, hitting a speed of 89.41mph at the bottom of the hill. Santa Cruz Skateboards recently released a video of the record-breaking run and it's terrifying and incredibly impressive seeing the speed with which Wester flies down the hill. "Once I drop in all my anxieties fade away I become relaxed and focus on keeping my body as still as possible and keeping my tuck tight. You must have complete confidence in your equipment, catastrophic failure is not an option." he said in an interview with Transworld Skateboarding. "Mentally, I have conditioned myself over many years of skating at high speeds to remain calm and take challenges that can be thrown my way." After he's told the speed he hit he says "Feels great man. Dream come true. Crazy, crazy speed." He also says that "We don't know what the limit is." Meaning his ambition doesn't stop at nearly hitting 90mph either, he now wants to try and beat his own record, maybe someday hitting three digit speeds.